There are two wrecks sunk at Mogán, they were both sunk for the Submarine tours which leave from Mogán Harbor. The old wreck is now broken up, but the new one is a large fishing vessel and they are both at a depth of 19m. They are covered in marine life as the Submarine tour feeds the fish over the wrecks to attract them for the tourists. The marine life has everything possible in large numbers and we try to time the dive so that the Submarine is there at the same time. How cools that! 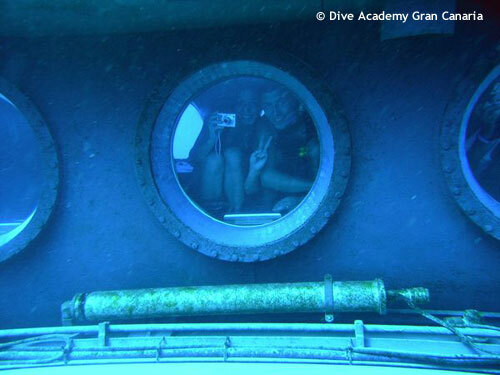 Dive Academy is a Padi 5 star IDC centre and Gold Palm resort. It is also Europe’s most southern Dive Centre. We are situated in the south of Gran Canaria on the sea front between two bays, they are both just a short walk from the centre. Dive Academy has multi lingual instructors and staff. Everyone is welcome at Dive Academy and our aim is for all our guests to enjoy there stay, be safe and most of all have lots of FUN!!! Dive Academy is the only dive centre on the island with its own private swimming pool! This swimming pool is the perfect place for all dives to learn or practise skills. Qualified divers or beginners, in our swimming pool you get all the time you need to learn the confidence building skills. For the young divers (8 to 10) we can do the Bubblemaker course in the pool, which is lots of FUN!! So from Bubblemaker to Instructor course the pool is the perfect place !! We run daily dive trips by boat and shore for the already qualified divers. We will take you to the best dive sites the island has to offer, including wrecks and reefs. We have lots of Marine life around the island including Rays, Turtles, Morays and lots of reef fish. Dive Academy has something to offer the whole family ! whether you are a wannabe diver or qualified diver. Whether you want the kids to learn to dive or just do some fun dives yourself- we have something to offer the whole family ! There are even sun beds at our swimming pool for divers and for the family or friends of the divers who do not wish to dive, to enjoy the warm Gran Canaria sun!! Just outside the harbor at Mogan are two small wrecks sunk to provide interest for the 'Yellow Submarine' adventure which runs there every day. Their shallow depth and compact nature makes them an ideal site for a first wreck dive, and experienced divers can cover both wrecks in one dive. Listen out while under water, and if you hear a loud whirring then watch out for the submarine as it makes it's hourly circuit around the two wrecks.